Cassandra's Legacy: Why Johnny can't understand climate: functional illiteracy and the rise of "unpropaganda"
Why Johnny can't understand climate: functional illiteracy and the rise of "unpropaganda"
Image from OECD Skills Outlook 2013. http://dx.doi.org/10.1787/9789264204256-en. These data show that most people in OECD countries have very limited capabilities of managing contrasting information. This lack of skill is the source of traditional propaganda (presenting to people a single side of the issue) but also of the rise of "unpropaganda;" that is, presenting to people so much contrasting information that they can't arrive to a firm conclusion. The result is uncertainty and inaction. Unpropaganda has been used with great effect on the issue of climate change. The "official" story that you normally find about "literacy" is that people all over the world are becoming more and more literate, that is, more and more able to read and write. Yet, there is another side to literacy: it is the concept termed, "literacy proficiency" that classifies people according to their ability to understand what they read. A recent survey on this point has been published by OCSE. It is a massive document of 460+ pages that examines the abilities of understanding and processing text by citizens of OCSE countries. The result is a subdivision in 5 "literacy levels," as you see in the figure at the beginning of this post. You can find the exact definition of these levels on page 64 of the document, but, summarizing, the lowest levels, below 1, 1, and 2, are relative to people able to arrive only at the simplest levels of understanding of a text. Even at level 3, one may be able to perform inferences based on the text being read, but the texts are said to contain "no conflicting information". Only at levels 4 and 5, some capability of critically discerning data from competing information is required. As usual, whatever you read on the Web should be evaluated with plenty of caution. What is the reliability of these data? Why five levels and not more, or less? What do these results mean? Digesting the long OECD report is not an easy task, but I think that, first of all, we can say what this classification is not: those who don't reach the highest levels are not necessarily stupid. For instance, my gypsy friends would fare very badly on the test, since most of them are really illiterate, not just functionally. But I can assure you that they are extremely smart, just of a different kind of smartness. Then, the gist of the OECD paper is not rocket science: the tests just measure people's ability to process written text and extract its meaning And if you are classed at, say, level 2, it means that you failed the tests for level 3, for instance showing that you are able to "construct meaning across larger chunks of text". And if you are classed level 3, it means you failed the tests for level 4, for instance to identify and define "competing information". In short, it seems that, everywhere in the OECD countries, most people (typically more than 90% of the population) are not able to critically evaluate contrasting information. 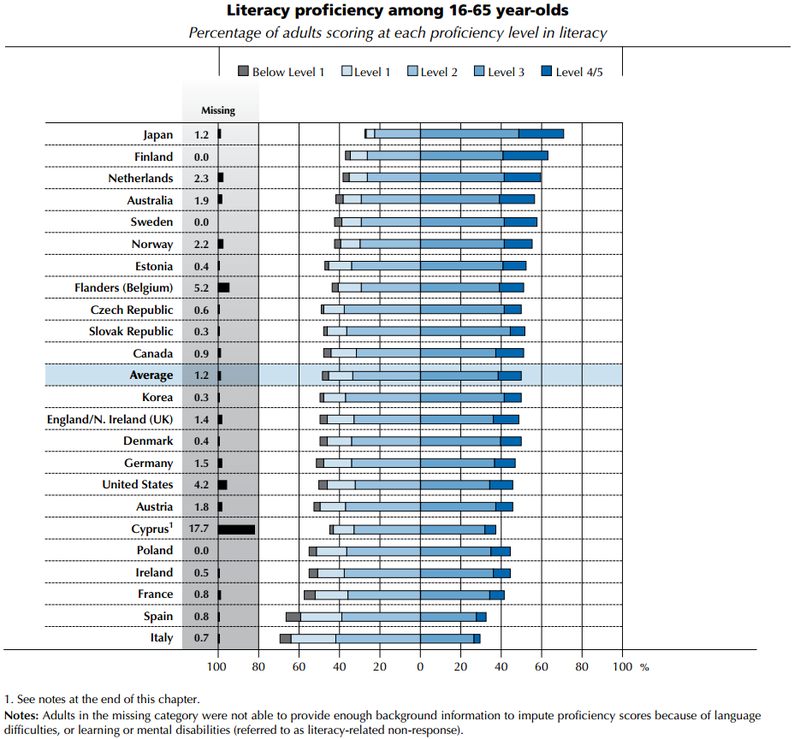 The OECD report doesn't use the term "functionally illiterate", but it seems that it is normally used to describe levels 1 and 2; that is, people not skilled enough to be able to cope in full with the present complex society. It is a shocking result: nearly 50% of the population of the "rich" OECD countries are in this condition (*). Even if you limit the definition of functional illiteracy to level 1, it is still a large fraction of the population, probably much larger than most of us would have thought. Are these results applicable to all forms of communication, including, for instance, what people hear on TV? This is not discussed in the OECD report, but I think it is hard to escape the conclusion that, yes, there shouldn't be a large difference. The data refer to people can read, and if some of them score so poorly despite being able to understand written words, why should they score differently when confronted with spoken words? Then, once you have seen these results, much of the ongoing political antics suddenly acquire a new significance. Some politicians, it seems, have attained success by tailoring their message to levels easily understandable by the large fraction of "functionally illiterate" people in their countries. Mr. Berlusconi, in Italy, is a good example; nowadays Mr. Trump seems to be using the same tactics in the US. This way of communicating is the essence of what we call "propaganda" (nowadays "public relations" or "consensus building"). It consists in presenting only one side of each issue, conveniently packaged in simple slogans: no subtleties whatsoever. It works: most people won't, normally, seek for, or consider, contrasting information. 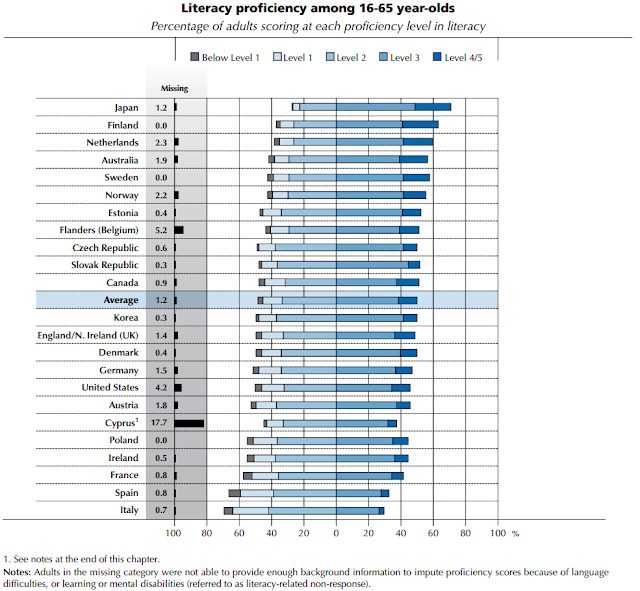 And now let's go to the question I wanted to examine in this post: what is the relevance of the literacy proficiency data on the climate change issue? As we all know, climate change is an extremely complex subject that requires years of study to be understood in its details. However, the climate change issue can be summarized to a simple statement that says: "if we keep burning fossil fuels, we will face a major disaster". It is the same kind of statement that says, "If you keep smoking, your risk lung cancer". And to understand that, you don't need to be an expert in epidemiology. Most issues can be presented in ways which can be understood by people at all the levels of the literacy scale who, as I said, are not stupid and perfectly know what's bad and what's good for them. The problem with the literacy scale is another one: it has to do with the debate on climate change. Here, we see the development of a communication technology that exploits the lack of functional literacy of a large fraction of the public. We may call this technology "unpropaganda." Traditional propaganda (literally, "what is to be propagated") aims at passing a message by eliminating or hiding all contrasting information. Unpropaganda, instead, aims at stopping a message from propagating by presenting a lot of contrasting information to a public unable to fully evaluate it. Unpropaganda works, and it works wonders. The OECD data show that no more than about 5% of the population in most OECD countries can extricate themselves out of a complex debate involving a lot of contrasting information. Now, look at the "debate" on climate science and you see that the idea of presenting "both sides" of the issue is far from meaning a balanced information. It is a strategy to confuse the public. It is not so expensive; well within the reach of the lobbies that would lose money from serious action against climate change. And it is incredibly effective. Look at the Gallup polls: note how the public is confused, easily swayed by irrelevant information ("climategate") or by false information ("the pause"). So, how do we fight climate unpropaganda? For one thing, don't expect that governments will work at cultivating people's ability of reasoning. I may be a conspirationist, but I guess that most governments are perfectly happy if their citizens are not so greatly skilled in evaluating information (despite all the talk in the OCSE report on the need of more skilled citizens). Then, there is little that can be done to change a situation that has evolved over several decades of mass media development. Unpropaganda is cheap and it works very well; it will stay with us for quite a while. Yet, understanding how unpropaganda works is a major step forward. For one thing, it is a further nail in the coffin of the so called "information deficit" model, that is the idea that if we explain to the public how things stand with climate change, they will understand and will do something about it. It doesn't work: the public does not lack information, they have too much of it! They are simply unable to make their minds. There follows that we should concentrate on producing high quality information, recognizable as such. It doesn't mean that we should retreat behind the paywall of scientific journals, but that we shouldn't engage in that kind of low level debate typical of troll-infested blog comments. In other words, we shouldn't run after deniers, trying to demonstrate that they are in error. That only generates confusion. Then, note how the denial side has been reacting so rabidly to the finding that 97% of the working climate scientists agree with the idea that climate change exists and it is mainly human caused. The 97% meme, indeed destroys the very basis of their unpropaganda strategy. It shows that there is a broad consensus among scientists about the issue. That's something that people at all literacy levels can correctly perceive. And, let me repeat it once more, no matter what their literacy level is, most people are NOT stupid. If a doctor you trust tells you to quit smoking; you may not be an epidemiologist, but you know that you'd better quit. If 97% of the world's climate scientists (and the Pope, too) say that we should quit burning fossil fuels, then you may not be a climate scientist, but you know we'd better do something about that. So, that's another point on which to concentrate our efforts. Not easy, I understand, but, as Sun Tzu said, if you know your enemy and you know thyself, you need not fear the result of a hundred battles. (*) It is some kind of a mystery why Italy, the country that once produced Dante Alighieri, fares so badly in the literacy list. On the other hand, after seeing these data, you are not surprised any more that Italy is the country that produced Berlusconi. Another insightful and useful post, Ugo. Of course I had noticed the rage with which the 97% consensus estimate has been attacked (who could miss it? ), but didn't connect that fact with the sheer simplicity of the message. It's something I will keep in mind when commenting on non-technical forums. Once my wife, little kids (this was nigh half a century ago!) and I went backpacking in Michigan’s Upper Peninsula, in what had once been “copper country”. The kids were shocked and upset at the economic deprivation that resulted when the mines gave out. I explained that there was plenty of copper left, but the day’s copper prices were not high enough to make it worthwhile to mine for it there, where the mining costs were higher than the price the miners (or mining companies) could get for it. They found this a shocking concept. We stopped for lunch in what had once been a nice restaurant. My kids asked the waiter-bartender-cook what the current price of copper was: 72¢ he replied, and went back to scrubbing the bar counter. Then the kids asked, what price could get the companies to reopen the mines? He looked up, thought briefly, and said 78¢, maybe 80¢. Then he added, dourly, “I don’t see that happening in my lifetime. Or yours.” In a conspiratorial whisper my son said, “I don’t think he got that from today’s Wall Street Journal.” Obviously, that waiter was not unintelligent. Once we got back home (Detroit, in those days), they told their friends of this shocking realization about prices. Their friends could not comprehend: they could not get past “High price bad, low price good” meme. I have long felt that this kind of functional literacy is teachable. (I know my kids and grandkids are outstandingly intelligent, but that’s not the point.) My kid’s spouses are every bit as brainy as my kids, but they have trouble with this kind of thinking. When presented with data and well-reasoned thoughts, they are okay… until the next day, maybe. I've always perceived it not as a "Information deficit model", but as a "deficit model" (it is often referred to as that) and have been wondering why people spend so much time trying to debunk it when it is clearly correct (the reason people don't understand so many things is that they have not been trained to process complex information and they have not been taught much of that information either). Anyway, one of the reasons the deep reasons the species is doomed even though within its members the complete understanding necessary to stop behaving in such a suicidal way does exist, is that the acquisition of knowledge and understanding has a very high cost for the individual and for society as a whole. Society has to pay for many years of education, while the inclusive fitness of the individual is maximized by spending his nights in the night club rather than in the library. So societies are reluctant to commit to the necessary spending while it is select few weirdos who try to educate themselves in depth about the world around them. And it will always be like that because what those weirdos are doing is highly maladaptive in the short term, so they get outcompeted by the people who engage in more conventional activities that maximize their immediate inclusive fitness. BTW, this probably applies to any intelligent species -- because nobody is born learned and solid education is so extremely costly, most individuals in a population are in the short term better off investing their resources elsewhere. 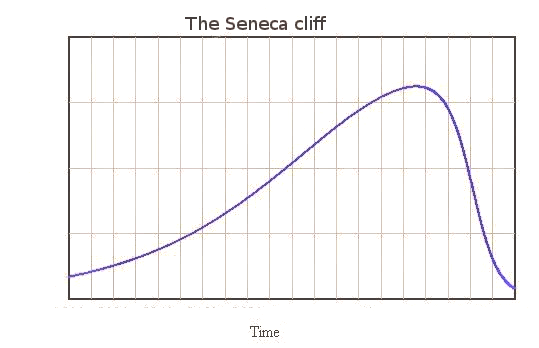 So if a lot of knowledge is necessary to break out of the overshoot-and-collapse cycle, and most of the population is guaranteed not to have it because of that factor, then the species is doomed to not achieve that before it goes extinct. Or if it does, it will be a very unstable condition that will break down as soon as a sufficiently large minority fails to be trained properly (which over a sufficiently long period of time will happen with a probability approaching 1). Well, Georgi, the (information) deficit model is typically intended just in a literal sense: lack of information. Your intepretation is that it should be intended as lack of information processing ability. It is true, but it is a question of definition. But there is a deep reason for that, and it is that even people who work in Science, Technology and Society field think of science as body of knowledge rather than as methodological system. We have had a well-executed campaign against government, regulation and climate change (pro Wall Street) for decades in the US. As a retired marketing guy, it really has been brilliant. We have think-tanks, purchased academics, scientists and politicians, a complete cable and radio news infrastructure, fake grassroots organizations, gerrymandering, and lobbyists -- the lot. All with the veneer of intellectual authenticity, and all with a single, well-focused message. And it has done a great job at shifting public opinion (in the wrong direction). If it wasn't so terrible, it would be something to behold. Of course this movement is very well funded by the business interest who sponsor and direct it. Because there is so much money at stake, their ROI on funding this movement is very high. It's into this headwind that we are asking our functionally illiterate society to make the right decisions. It's like a local food coop pushing organic carrots against McDonalds, Cheetos and Chipotle all at once as the answer to obesity. If you are interested, the Arch Druid Report blogged on a similar theme last week. Fascinating. Y'all own the 97 percent and whine over the remaining 3 percent. Or is it 43 percent? You write eloquently of the need to process information critically; and yet, how many readers processed THIS page? What exactly is the 97 percent? It is the number of papers that assert some degree of human impact on climate. That's trivial and meaningless. It is also about 70 papers of 11,000. How do you get 97 percent out of that? Throw away nearly all the 11,000 papers that mention climate change. It would be easy to have it be 100 percent but that would be suspicious. Strange that 97 percent is not equally suspicious. I have a doubt that 97 percent of scientists agree on the exact nature of gravity and the multibillion dollar Large Hadron Collider exists to settle a dispute in the Standard Model of Physics. A more recent survey asking respondents to quantify human impact. 43 percent of the respondents were 95 percent sure that 50 percent or more of climate change is human caused. It is a continuum and a spectrum of belief. Where you put yourself on that continuum reveals more about your "religion" than about actual science. And you are making my day. Thanks. We analyze the evolution of the scientific consensus on anthropogenic global warming (AGW) in the peer-reviewed scientific literature, examining 11 944 climate abstracts from 1991–2011 matching the topics 'global climate change' or 'global warming'. We find that 66.4% of abstracts expressed no position on AGW, 32.6% endorsed AGW, 0.7% rejected AGW and 0.3% were uncertain about the cause of global warming. Among abstracts expressing a position on AGW, 97.1% endorsed the consensus position that humans are causing global warming. In a second phase of this study, we invited authors to rate their own papers. Compared to abstract ratings, a smaller percentage of self-rated papers expressed no position on AGW (35.5%). Among self-rated papers expressing a position on AGW, 97.2% endorsed the consensus. For both abstract ratings and authors' self-ratings, the percentage of endorsements among papers expressing a position on AGW marginally increased over time. Our analysis indicates that the number of papers rejecting the consensus on AGW is a vanishingly small proportion of the published research. People are perfectly capable of understanding that burning fossil fuel is bad. They just don't WANT to understand it. Dan Gilbert on biological reason for lack of action against climate change. I completely agree with Ugo: we have to focus on simple messages, something that destroy the "debate". The 97% example is a very good one. But we must keep present another issue. Illiteracy is usually way worse than the abiity to comprehend oral reasoning. Not so worse, say 1 or 2 points in the score above, but significant. This is true at any level. People understands better a spoken lesson tan the same content in a book (for me it is right the opposite), or listen longer to a speaker on a dummy youtube speech than reading the same material on a blog. Thsi means that we have to use more youtube speechs and less blogs. 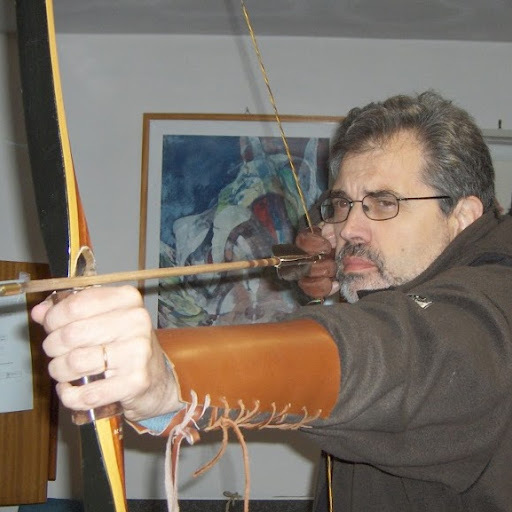 I just read Massimiliano's posting on population growth and technology in Effetto Risorse as well as the recent announcement by MIT on new technologies they are developping to contain a fusion reactor (superconducting tape, etc.) -- and I have a question. It had never occurred to me that a clean energy breakthrough might not be a good thing. What is a bigger risk? That we are going to develop a clean energy source such as fusion, and that human activity will continue to grow, and it will break some other global constraint? Or that we will never have that technological breakthrough? Ugo, I would like to raise a question related to general methodology. If we follow your logic here, it seems to me that we should also respect the consensus of working experts in fields ranging from astrology and homeopathy to nuclear power, GMOs, pharmaceuticals, vaccines, pesticides, economics, finance, defense strategy, dietary advice, etc. For mere laymen outside the field to doubt these experts' consensus regarding the safety or effectiveness of the products or agendas they are involved with would be equally rabid, no? What is your test for separating the genuine trustworthy experts from the liars, fraudsters, kooks and cranks? Because simply bowing down before consensus on the basis that experts must be trustable seems rather naive. The experts are to be trusted in theoretical math-heavy fields and in fields that deal with physical systems, and where proper controlled experiments can be done. There isn't a lot of room for persistent mass delusion in those areas. On the other hand, the softer the field, the higher the risk of it being ideologically infused and turned into a propaganda tool for a particular political agenda and of the "experts" in it ending up in positions of authority because of their adherence to/usefulness for certain ideology/agenda than true expertise. An additional criterion is the average grasp of the physical sciences exhibited by the authorities in a softer field -- if they are talking absolute BS that contradicts our most basic understanding of how nature works, then one should not trust anything they say, because this is the most basic sanity check and they fail it. That's why vaccines, GMO and the likes are areas in which the safe bet is to trust the scientists, even if their opinion is unpopular, but mainstream economics is a pseudoscience on par with astrology. I think Georgi makes some good points. I would add that it is obvious that consensus, in itself, is not enough to arrive to the truth. However, with climate change, we are in a condition in which we can't afford any more the kind of intellectual game playing that we enjoy in other sectors of science. At this point, it is a question of survival, and when you fight to survive you use all the tools you have at hand. It has been said that scientists found themselves involved in a kind of bar fight for which they are not accustomed. It is true, but it is also true that we can learn how to fight this kind of fight. If PR is being used to attack science (and to threaten the very survival of humankind), then it is legitimate to fight back using also PR. Consensus is one of the tools we can use and we should use it. "Softness" of a field might be a factor, but IMHO a much higher risk factor is the amount of money/potential profits involved. Economics is an obvious example, but see also the ongoing scandal in the medical / pharmaceutical field where it would seem that half of the studies are "wrong". Same issue with GMO's, but there a big part of the problem is the patents on living things. Thanks very much all three of you for your responses. I think we all have our preferences, our biases and our areas of competence, even if we can't claim any expertise. If we are convinced, based on our considered judgement of the evidence that we've been presented with, that there is a crisis of survival that demands action, we have a moral duty to act to solve it. At the same time, if our judgement leads us to conclude there is no such crisis, we are probably going to object to being railroaded into acting for a cause we don't support. It's easy for me to see how this kind of dynamic could escalate into a bar fight even if most people on either side were totally sincere. Add to this accusations by people on each side that those on the other side are not sincere, and you have a recipe for confrontation, which is where I think we have arrived with climate change. Incidentally, in the light of peak.singularity's mention of the current medical/pharmaceutical scandals, I am currently reading "Inventing the Aids Virus" by Peter Duesberg, which was published in 1996, and I find it very eye-opening and filled with facts (as well as with Duesberg's opinions) on the history of disease treatment and the sciences of bacteriology and virology. Back when the book appeared, I didn't read it because I had been successfully convinced by the media that Duesberg was "an AIDS denialist" and a fraud with an agenda. And yet there is so much in his book that anybody with an aspiration to gain a clear broad view of the AIDS issue would need to know, including many things that "the AIDS industry consensus" would much rather we didn't know or think about. In my considered opinion (which is admittedly fallible) after reading Duesberg and noting what has happened in the intervening two decades, the consensus on HIV/AIDS was led by virologists, who following their earlier success with polio had failed to find viral causes for most cancer and in HIV found a new gravy train to jump on, and the pharmaceutical industry, which just can't resist marketing expensive new drugs for frequent or lifelong consumption by millions of people. They quite reasonably felt compelled to work for their own survival and prosperity, and they marshaled a very strong consensus toward that end. Incidentally, regarding the chart on literacy, pondering the reason why the Japanese are apparently so proficient, one factor is that the Japanese language as it it is used today demands more effort on the part of listeners and readers than is generally the case with users of European languages because Japanese speakers and writers tend to be less explicit. The topic is generally overtly mentioned only at the beginning of a conversation or discussion, after which it is unstated in subsequent sentences on the understanding that remains the topic by implication, until the next topic is mentioned. So readers and listeners need to bear in mind what the topic is without being reminded, and someone who eavesdrops on a conversation midway through, may have a hard time guessing what the subject is. I work as a Japanese-to-English translator, and based on my personal experience, I would expect the Japanese to be way down the field in terms of writing proficiency, and I would add that the lack of dedication to clear, concise writing places a higher burden of interpretation on the reader. I do not want to labour this too much but scientific knowledge needs some careful distinctions. Ugo is better positioned to talk about this in the physical sciences; (I was a plant scientist specialising in certain detection technologies of plant viruses and similar entities). A fundamental physical hypothesis that goes beyond existing theories and their well attested results needs a lot of 'strong' tests'. The Wikipedia article on testing Einstein's General Relativity tells a long story of trying very properly to prove GR 'wrong' or 'not sufficiently accurate' under ever more rigorous conditions. Even where fundamental changes in physical theory are neither expected nor indeed needed, testing hypotheses in very complex interactive environments is highly problematic using a 'deterministic' or 'mechanistic' method of enquiry. This applies to medical fields. In this field also there may actually be 'unknowns' needing to be 'discovered' in the control systems inherent in biology. It is not necessary for research to be 'badly done' or to be fraudulent to be contradictory. The study or experiment might even be 'repeatable' most of the time while at the same time others with a different approach get different results. It happens all the time. I have not read the particular book about HIV but I remember corresponding for a while with a nice man, William Bauer, a Professor of Chemistry, who was publishing his own articles (he was Editor) where he took issue with the then current HIV orthodoxies. He had no difficulty in finding some anomalous results, but he did not understand much about RNA viruses, nor 'retroviruses' and relevant distinctions. I hoped to save him embarrassment. My understanding of 'Climate Change' due to human activity, particularly industrialisation, is that there is no fundamental challenge to the physics of CO2 and other GHG and their global solar heat trapping effect. And the dramatic rise in atmospheric global CO2 and CH4 in industrial times is simple enough to observe. Nor is there much to challenge a fundamental role for GHG in the geological record of climate change. However, the measurement of such a large complex system is challenging. Predictive calculations produce uncertainties. But it would be startling indeed if both the well-attested physics and observations of GHG did not produce what will be for humans, dramatic changes within coming decades. Dan Kahan on the efficacy of using the 97%. I have no personal opinion on this matter. Just thought of it when I read this post. third, because it predictably reinforces the toxicity of the climate chagne debate for our science communication environment. I will make here more or less the same comment that I made to the Italian translation of this post. And let me explain why I say more or less. In the Italian translation illiteracy or not being literate was correctly translated as "analfabetismo" . Tradionally in Italian this means someone who can't read or write. And the opposite of someone who can't read or write is someone who can. In English however the (literal) opposite of being illiterate is being literate. And it makes more sense then to speak of different possible levels of literacy. In Italian I thought it made less sense of speaking of different levels of "analfabetismo" which literally means one who does not possess mastery or proficiency with the alphabet. Namely one who cannot read or write. So perhaps in English it makes more sense to speak of functional or other levels of illiteracy or literacy. But I still would prefer to have a simple and clear definition of illiteracy as referring to persons who cannot read or write. And refer to the other levels in the OCSE categorization as different levels of comprehension or of understanding, or of grasping the actual meanings or significance of what is being stated or being able or not to process different amounts and quality of information or some other more precise and appropriate terms. As far as the matter of "unpropaganda" here I feel that a new term or category is perhaps being created needlessly. There are very many ways of doing propaganda and what is defined or characteristized here as unpropaganda seems to me like just another form or way of doing effective propaganda in the broad sense rather than the literal one, which I perhaps think of too broadly as "exercises in deception" meant to mislead, misrepresent, confuse, and even drown in information and in different opinions or views that are difficult to evaluate critically... since the ultimate effect is similar. But I agree with and like the whole second half of the post on climate change and of course I also agree that there is a difference between consensus and truth and that the objective is to achieve consensus and even more importantly to then do something based on it. In many areas of life we don't.know what the precise truth is or why it's true but we know enough or think we know enough to take at least "relatively informed intelligent and appropriate action" just like when we drive a car or cross the street avoiding the traffic. In terms of evaluating information critically I think this should apply also to the categorization of illiteracy and literacy suggested by OCSE. in that particular case I do have time to think about it a bit more and I will. After I have done so I will either embrace it, reject it or qualify it. Just as I would with ideas or models coming out of other official public institutions such as the World Bank, the IMF and many other ones. Could be good stuff or great stuff or it could be inappropriate or misleading or lead to more confusion instead of less. Public institutions are certainly not beyond doing their own forms of witting or unwitting propaganda. People are much better informed than you give them credit. They know that fighting climate change by eliminating fossil fuels will be expensive and mean a very reduced lifestyle for all, yes, all. Billionaires and millionaires will still be comfortable but the rest of us will have to work very hard to keep from starving and most, yes most will not survive. The fact that the oil is running out anyway and burning what we can get will fry the earth in a hundred years is completely irrelevant. They can hardly think past Christmas. The fight to prevent climate change will only be won at bayonet point. It will involve cattle cars, no long needed for their original purpose as cows will have been banned. Instead of concentration camps people will be taken to dispersal villages where they will be forced to grow their own food. You fail, you die. Remember, people have to eat locally to save the planet. With robot like cooperation it could be achieved peacefully but, fat chance. A very nice, possibly important discovery. However, the name "unpropaganda" is wrong. The defining characteristic of propaganda is not that it just spreads a message, but instead that it does that in a manipulative way. Obviously unpropaganda also manipulates and in this core attribute they are the same. Thus unpropaganda is actually just a special kind of propaganda and should be named differently. I think unpropaganda can be argued to be the correct name. Literally, it means "what should not be propagated", and it is what it does by drowing truth in noise. But, on the whole, I think that propaganda is winning hands down. I started keeping track of all the friends who find no other subject of conversation except telling me what they read in the press or they watched in tv. Almost all of them. Propaganda is winning.